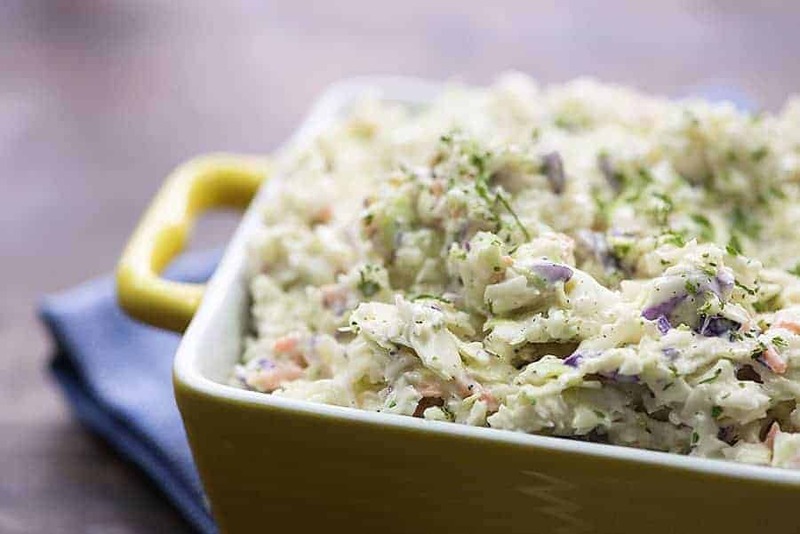 This keto coleslaw is the perfect side to any BBQ or family dinner! It’s beyond easy to prepare and only takes a couple minutes. My mama has been making coleslaw to bring to every family get together for as long as I can remember. It’s a totally simple recipe, but she does one special thing that takes it over the top and makes it SO GOOD. Everyone raves about it! We use it to top pulled pork or serve on the side alongside any grilled meat. 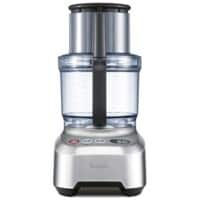 My mama’s secret is all in her food processor. She buys a bag of coleslaw mix and then pulses it in the food processor to grind it down. It looks super similar to KFC coleslaw – little chunks of cabbage instead of big shreds. Of course, this healthy coleslaw doesn’t have any sugar. It really doesn’t need it and I don’t think you’ll miss it at all! 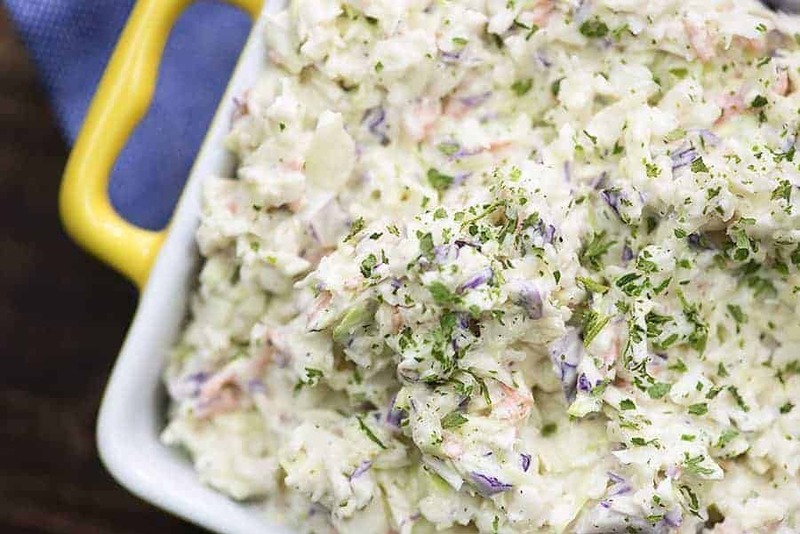 You can certainly sweeten it up with the sweetener of your choice if you like your coleslaw on the sweet side. Promise me you’ll try it without first and see what you think! 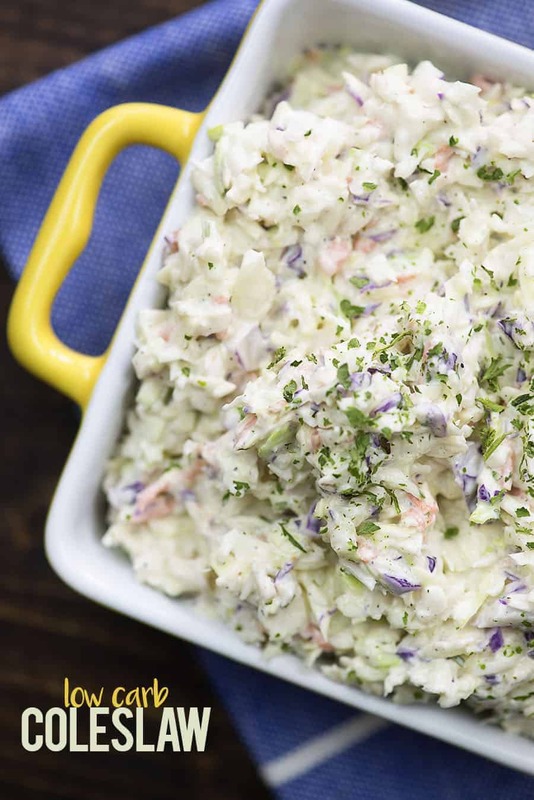 This low carb coleslaw recipe needs just a handful of ingredients. For the slaw itself, you’ll just need a bag of shredded coleslaw mix. Easy! For the coleslaw dressing, you’re going to use mayonnaise, a little bit of prepared yellow mustard, some heavy cream, and a little seasoning. You can use a little garlic salt and black pepper or you can use Nature’s Seasons blend. My mama always uses Nature’s Seasons, but it’s good with garlic salt and pepper if you don’t have that on hand. Isn’t that coleslaw dressing so simple? 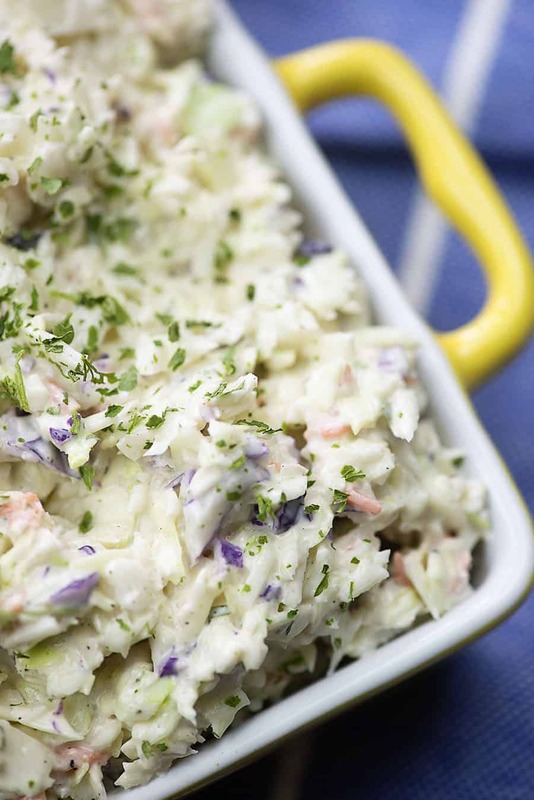 If you like sweet coleslaw: you can handle this one of two ways – add a tablespoon of the sweetener of your choice. Alternately, and this is my preferred method, you can dice up a large tomato and it to the mix. If you’ve never had tomato in coleslaw, you should definitely give this a try. It adds a touch of sweetness and it’s seriously SO GOOD. Give it a try!! This homemade coleslaw recipe is so delicious! You’ll just stir together the coleslaw dressing and then pour it into your cabbage and stir it up. As the mixture sits, the cabbage releases a bit of water and the mixture will be a bit wetter, but this seems to be the perfect amount of dressing – it’s good right away and it’s still good after it’s been chilling the fridge for a few days. There’s just 3 grams of carbs per serving in this recipe. I think you’re going to love it! This low carb coleslaw takes just a handful of ingredients and it's so simple! The coleslaw dressing works perfectly every time. Add the coleslaw mix to a food processor fitted with the blade attachment and pulse until you have small chunks of coleslaw. Remove from the food processor and add to a mixing bowl. Add the mayonnaise, heavy cream, mustard, garlic salt, pepper, and chives to a small bowl and whisk together until smooth. Pour the coleslaw dressing over the coleslaw mix and stir to combine. Serve immediately or cover and store in the fridge for up to 3 days. Serve as a side dish or over my low carb pulled pork! I have been craving Cole Slaw ever since I started Keto in July of this year. My husband makes a phenomenal Keto Mayo so I knew we could make Cole Slaw, but we haven’t yet. He promised me we’d make it tomorrow. I can’t wait. I can’t do a lot in the kitchen because I am handicapped. I’m so thankful that he is a chef extraordinaire! He probably could have made the Slaw, but I’m glad to have your recipe! Holy moly, this was soooo good! I accidentally made it with two tablespoons of mustard (thought I was looking at the measurement for mustard, when it was actually for the heavy whipping cream), and it is amazing nonetheless! Next time I will try it with the correct measurements. Thank you so much! What is that green stuff you are sprinkling on top at the end of the video? I just made this dressing, but decided to change it a bit. I added 1 tsp. garlic powder, 1/2 tsp pink salt, 1 tsp of dill pickle juice and 1/2 tsp of Sriracha. I also added the tomatoes you suggested along with scallions and English cucumber. WOW it was great and my entire family loved it! Thanks for a great recipe.. 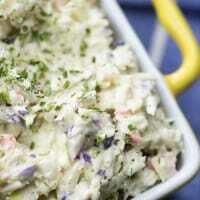 I love this recipe..the blender is my favorite way to make cole slaw. I add a packet of a keto approved sweetener. The BEST! I didn’t add any sweetener, and used flax seeds instead of sesame because I had it on hand. Fantastic! Will make it forever! Thank you! I really enjoyed this. I do like mine with tang so I added about 3 tablespoons vinegar and a scant teaspoon of coconut sugar for a little sweetness. I didn’t have chives on hand so I put in some green onion. Really good stuff! I added some finely diced jalapeño and a few squirts of lime juice. Really brightened up the flavor. I could eat this all day! I was also wondering the amount per serving. so I did calculations according to how much shredded cabbage weigh. 1/2 cup is 1 serving for this recipe that’s before all other ingredients are added. so a little bit of further math is involved if you want to find out how much nutrition, carb e.t.c you get per serving. just wanted to give a base to start with. Instead of prepared mustard, I used Coleman’s dry mustard and Hinz apple cider vinegar. I used fresh cabbage, tiny bit of carrots and green pepper. I added some white, cayenne and black pepper. I wasn’t sure that I’d like the fine grind; but, it was a tasty change from the shredded slaw. Served it with salmon steaks and cheesy cauliflower crowns. I plan to purchase the book. Having to change my way of eating at age 75. I think it’ll be easier than I feared. Sounds like some great changes! I’ve never tried adding green peppers to my slaw.